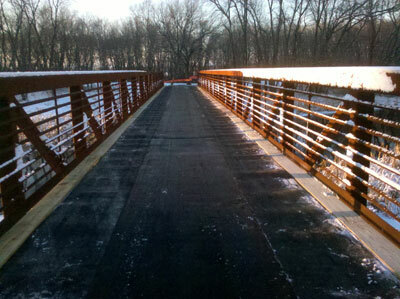 Prevent unnecessary wear and tear on your bridges by protecting them with our rubber bridge matting. Bridge the gap between building, maintaining and sustaining your bridge. Protect the longevity of your bridges by lining them with our rubber bridge matting made from recycled conveyor belting. Our bridge matting has been used at golf courses, parks, snowmobile bridges and everywhere in between. When you think about it your golf course bridges take a beating. Weather it’s cleats or carts those bridges are taking a beating every day. Our rubber bridge matting protects your bridges and walkways at your golf course. Simply lay it on top and if needed put a few screws to keep it in place. Since our mats are made from durable rubber, they are perfect for wet areas. If you are looking to provide more traction to your bridge our belting can help you out there as well. We have a variety of belt profiles in stock. We have belting with diamond top, v cleat mini bite and halfmoon profiles. View our belting profiles now. Protecting your bridge from the elements hasn’t been easier our rubber mat belting is the perfect solution.